Vinayagar or Ganapathi, easily recognized as the elephant god, is one of the most important Hindu Deities and brings Wisdom and good fortune. Before any undertaking, be it laying of the foundation of a house, or beginning any other work, Vinnayagar is worshipped so as to invoke his blessings. Vinnayagar means supreme or "one with none other more supreme". 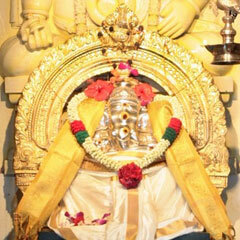 The form of Vinayagar represents the Auspicious "Aum" written in Tamil. The sound made by an elephant represents the sound made when pronouncing "Aum" more than the sound made by the other animal. Ganapathi represents a Man of perfection who has realized the Supreme truth. The form of the Lord is Pregnant with suggestions which carry the highest Vedantic thought. The large head and ears of the Lord indicate that he had gained profound wisdom through listening (Sranvana) and reflecting (manana) upon the truths of the Upanishads. Vinyagar has many names. The main ones are Ganapathi (lord of the Ganas, attendants), Vigneshwara (remover of obstacles) and Gajaanana (Elephant Faced) By worshiping Vinayagar, one seeks Gods Blessings for achieving success in one's endeavors in the physical world and for attaining thereafter.